The last sports game I recall playing, outside of Wii Sports and the occasional Mario Tennis, was American Gladiators on the NES. Don't give me that look. Who doesn't enjoy watching adults roll around in giant hamster balls or beat each other with Nerf bats? Outside of that, the sports genre holds little sway over me - and with all the lawyering, cooking and surgery games available up for the DS, Olympic-style sports seem dull by comparison. 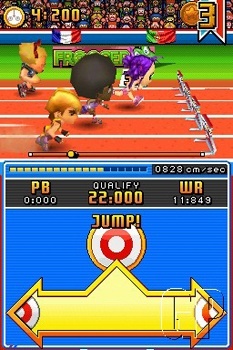 The Nintendo DS, much like the Wii, draws heavily on the whimsical and the bizarre, so what chance does that give a straightforward game like New International Track & Field? As with most things, it depends on how you approach it. Gameplay wise, it's fairly simple: rub the stylus back and forth across the screen at high speeds and tap on-screen icons or buttons to accomplish whatever mini-game goal you're shooting for. Beyond that, it's all in the timing - and your individual ability to deal with a violently ramping difficulty curve. The Career Mode takes you on a slow road through the game's 24 sporting events, chopped down into six groups of four. Each group unlocks the next and you have to complete Easy before Medium before Hard. Single Event mode, however, has no difficulty setting and Konami apparently decided to use that void as an excuse to slam players headfirst into the hardest difficulty setting possible. Needless to say, the whole ordeal elicited no small amount of profanity, but in a fun way. Or at least I've been enjoying it. It's entertaining in the same way Ninja Gaiden was on the NES, even after being knocked in a death-pit by a swooping bird for the umpteenth time. For my part, it was the promise of unlockable Konami characters such as Simon Belmont, Solid Snake, and the Pyramid Head monster from Silent Hill 2 that convinced me to pick up this little gem in the first place. And yes, springing off a vault into mid-air somersaults as Pyramid Head is exactly as hilarious as it sounds. Though, I must have missed the day it was decided to turn the original videogame vampire hunter into a redheaded, girlish man-boy. Oh, how the mighty have fallen. The character designs were handled by an art studio called UDON Entertainment, and if you didn't know they've been working with Capcom on various Street Fighter projects, you could probably extrapolate it from how familiar some of their "original" characters look. But who needs them after you unlock Pyramid Head, anyway? If the online multiplayer is any different from the single player, I couldn't tell you. No games were active any of the times I logged in - hopefully that'll change - but the Wi-Fi connection also provides worldwide high scores for you to compare your meager efforts to and weep with shame, so at least that's something. Round it out with the menu background music being a remix of "Chariots of Fire" and you have a fun, if frustrating, distraction with some fan-boy favorites thrown in for flavor. Bottom Line: While I am afraid a fit of frustration will drive me to scrape the stylus straight through the screen, the system and even my hand, it's still the kind of wall I don't mind banging my head against. It makes each win feel like a real accomplishment. Recommendation:Try it. And if the challenge doesn't interest you, maybe you'll luck out and the person before you will have already unlocked all the hard stuff. Thaddeus Stoklasa is completely invulnerable to everything in the Universe, except fragments from his home planet... which is, unfortunately, Earth. Check out more of his ramblings at http://threegeek.blogspot.com.